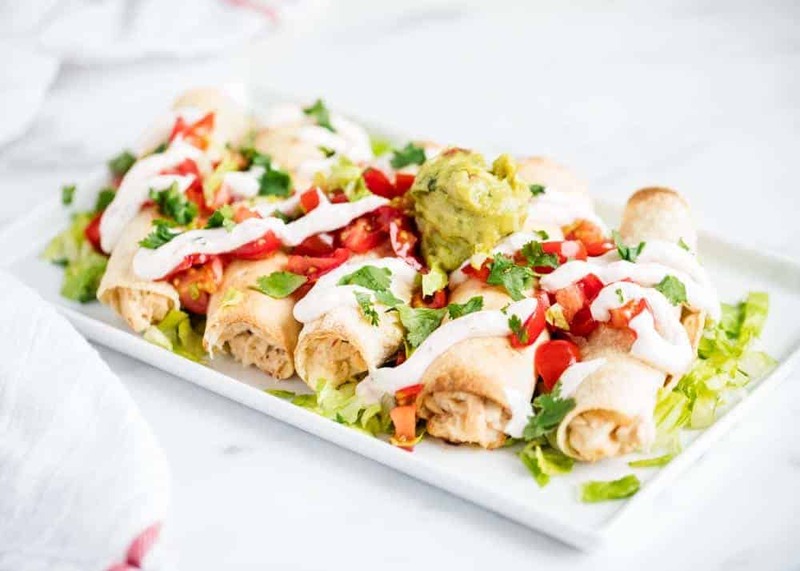 Baked Chicken Taquitos – An easy and delicious dinner recipe that’s perfect for busy weeknights! Crispy on the outside, creamy on the inside and full of fabulous flavor. If you’re a fan of Mexican food, you’re going to love these homemade taquitos. 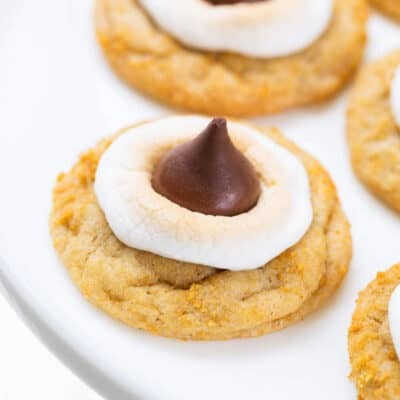 They’re easy, quick and taste absolutely amazing. They’re one of my favorite Mexican dishes, as well as chicken enchiladas, beef enchiladas, fajitas, tacos and carnitas. I love all types of Mexican food, but taquitos have to be one of my favorites! They are crispy on the outside, creamy on the inside and have such great flavor. Plus they taste amazing loaded with ALL the toppings, like guacamole, pico, cilantro and sour cream. We make these baked chicken taquitos quite often at my house and they are always a big hit! Everyone in the family loves them and gets so excited when it’s taquito night. They taste great served with beans or Mexican rice. So, so delicious! What are taquitos made of? 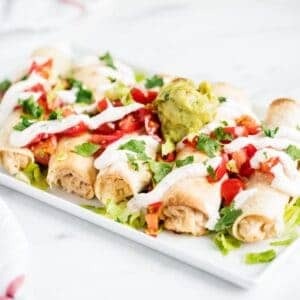 These chicken taquitos are super simple to throw together and are made with less than 10 ingredients! I like to use a rotisserie chicken to make it even easier. I also like to use flour tortillas, as my family prefers them and I’ve found that they crack less. To prevent your tortillas from cracking, heat them in the microwave for about 20-30 seconds between damp paper towels. This helps them steam and keeps them flexible so that they don’t break from the weight of the chicken mixture when rolling. Homemade taquitos are actually very simple to roll! Once you have the process down, you’ll be a taquito rolling machine. To start, simply heat tortillas in microwave (to enhance flexibility), then add chicken filling to the center of each tortilla. Fold one side of the tortilla over on top of the chicken mixture and tightly roll all the way through. Then place the rolled taquito seam side down on your baking sheet. 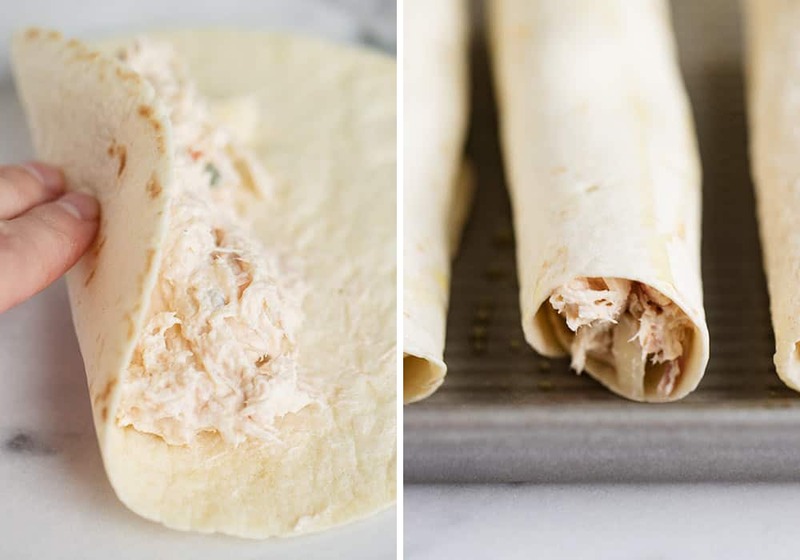 Scroll down for the printable chicken taquitos recipe. Preheat oven. Preheat oven to 400°F and line baking sheet with foil and lightly coat with nonstick spray. Combine filling and stir. Stir together cream cheese, salsa, cumin and garlic powder. Then add in cheese, cilantro and chicken and mix. 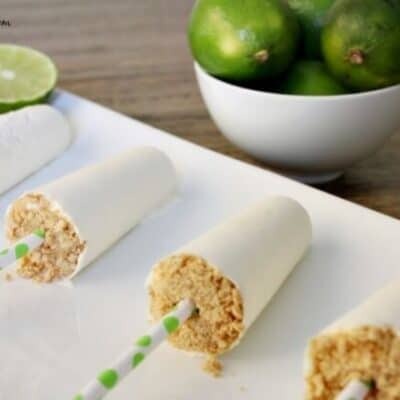 Roll taquitos. Add about 3 Tablespoons of the filling to the center of tortilla and roll up. Then place the seam of the tortilla on baking sheet and lightly brush with olive oil. Sprinkle salt on top if desired. Bake and serve. Cook for 13-15 minutes in oven until lightly browned. Add favorite toppings and enjoy! TIP: You can also fry your taquitos as well (use corn tortillas if frying). Heat 3/4″ vegetable oil in a deep large skillet to 350°F. Add 4 taquitos (seams down) at a time and fry 2 minutes per side, or until golden brown. Place on a plate lined with paper towels. Can you freeze chicken taquitos? Yes, taquitos make a great freezer meal. You can freeze them baked or unbaked. Simply place taquitos seam side down on a freezer safe baking dish and cover tightly with lid or plastic wrap/foil. Place in freezer (make sure they are leveled) for up to 2 months. When ready to eat, preheat oven and add frozen taquitos to a foil lined baking sheet. Spray with nonstick spray, then bake in oven until warmed throughout, about 15-20 minutes. What do you eat chicken taquitos with? 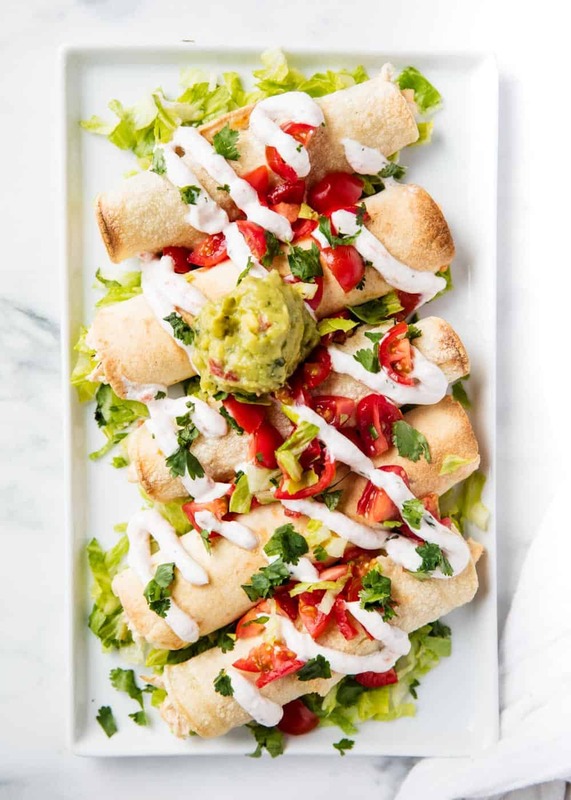 I love to top my chicken taquitos with pico de gallo, cilantro, guacamole and sour cream. They taste great served with Mexican rice, black beans, refried beans or Mexican street corn. Baked Chicken Taquitos - An easy and delicious dinner recipe that's perfect for busy weeknights! 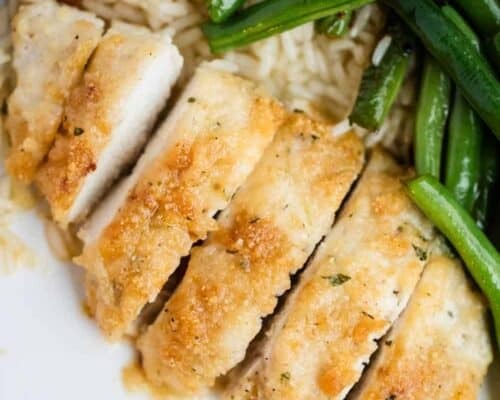 Crispy on the outside, creamy on the inside and full of fabulous flavor. Preheat oven to 400°F. Line a baking sheet with foil and lightly coat with cooking spray. Stir together the cream cheese, salsa, cumin and garlic powder. Then add the cheese, cilantro and chicken. Place 3 Tablespoons of the chicken mixture in the center of a tortilla and roll up. Place seam of tortilla on pan. Lightly brush the tortillas with olive oil and sprinkle salt on top if desired. Cook taquitos for 13-15 minutes, or until lightly browned. Tip: To prevent your tortillas from cracking, heat in the microwave for about 20-30 seconds between damp paper towels. If you prefer to fry your taquitos (use corn tortillas): Heat 3/4" vegetable oil in a deep large skillet to 350°F. Add 4 taquitos (seams down) at a time and fry 2 minutes per side, or until golden brown. Place on a plate lined with paper towels. We make these taquitos ALL the time and they are amazing! We double the batch and freeze them for easy dinners! Sounds great! I love taquitos, but they’re usually fried and unhealthy. This is going to be a life saver! My grandson (10) has fallen in love with these. I can’t keep buying them and they are so easy and reasonable to make. It was getting too much! Then I see this! Thank you for saving my budget and my pantry! These satisfy him (which isn’t easy) and I appreciate it! Happy New Year! Taquitos are one of my favorite meals! I can’t wait to try these! 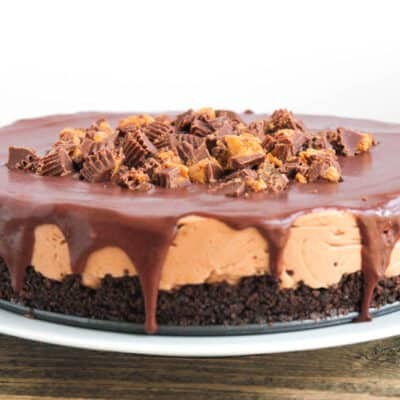 I know you posted this a while ago… but this is a great recipe for me this week! I love to use my crock-pot around the holidays because it makes dinner so much easier during the busy time :) Thanks for sharing! 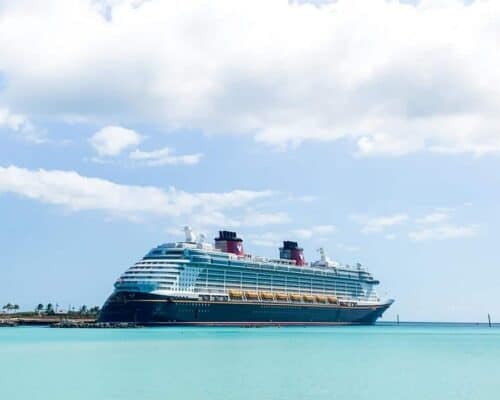 This is my first time visiting your blog and I came across this recipe–I already have it bookmarked! yum! Oh my. These look just delicious! This sounds delish! I have a friend that used to make her own taquitos. I've never tried it though. We now follow you publicly through google friend connect. Please visit Mom to Bed by 8 and do the same. Yum! Tex-Mex, Mexican, whatever! It makes me weak in the knees!